Progressive Classical Music Award – Compose the “excellent song”! Bringing fresh air into the chamber music scene and revitalizing the classics was the aim of the Twiolins when they launched the Progressive Classical Music Award (PCMA). The PCMA was initiated in 2009 by The Twiolins (Marie-Luise & Christoph Dingler) first under the name Crossover Composition Award, to expand the repertoire for the instrumentation of two violins. Since then, every three to four years they have set a special task for contemporary composers: to compose new music for two violins, which gets under your skin and leads you to storms of enthusiasm. The competition has deliberately been openly designed to allow novel music to emerge with contemporary emotions. This in turn should contribute to a sustainable development of the classical concert and audience. The previous competitions took place in 2009, 2012 and 2105 and had a total of more than 500 participating composers from 55 countries. The PCMA celebrates its 10th anniversary in 2019 and the success story that started in 2009 continues. Due to the individuality of the individual compositions, it is difficult to find a generic term for the resulting music, but it is intoxicating sounds and rhythms, often inspired by film music, minimal, avant-garde, Balkan and jazz grooves, but also with very own and new stylistic devices. As a new genre designation, the term “progressive” was introduced. The concept works out: The Twiolins have been touring with this repertoire since 2009 and fascinate people all over the world. Both classical fans and absolute newbies react with enthusiasm to this music and to the unusual cast with two violins. 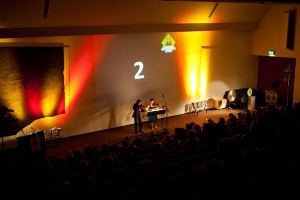 The heart of the competition is the final concert: After a pre-selection by a panel of experts, six compositions will be selected and presented to an audience for voting. To ensure absolute fairness, the compositions remain anonymous, identified only by a number and played by The Twiolins to the expectant audience. Then each listener is allowed to vote and the results are counted. The work that can collect the most votes wins the first prize. The winners will receive prize money worth a total of € 11.000. The compositions are published internationally by renowned publishers: 2012 and 2015 Peer Music, 2009 Ries & Erler, and are recorded by the Twiolins: 2011 “Virtuoso”, 2014 “Sunfire”, 2017 “Secret Places”. The compositions have already inspired subsequent generations: Since 2014, the works are performed at the national competition “Jugend musiziert”.